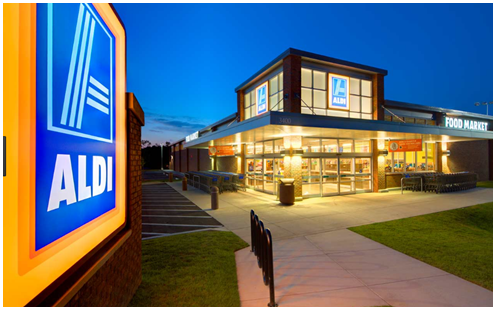 ​​​TEXAS – Aldi's plans to open 900 more grocery stores in the U.S. by 2022 include aggressive inroads in Texas. In 2016, a new distribution center opened in Rosenberg, near Houston, and Aldi split the state into two divisions, giving it more capacity for new stores. Aldi said that it will spend $3.4 billion to get to 2,500 stores across the U.S. by the end of 2022. The North Texas division plans to open five to ten stores a year, said Scott Huska, division vice president, and Rosenberg may open a few more than that. Aldi owns 183 acres around its Denton distribution center and it could easily expand, Huska said. Aldi is already spending $1.6 billion to remodel and expand most of its 1,600 stores in 35 states. It's spending $66 million to remodel Texas stores by 2020. ​Want mor​e data? See DFW Retail Market Research.